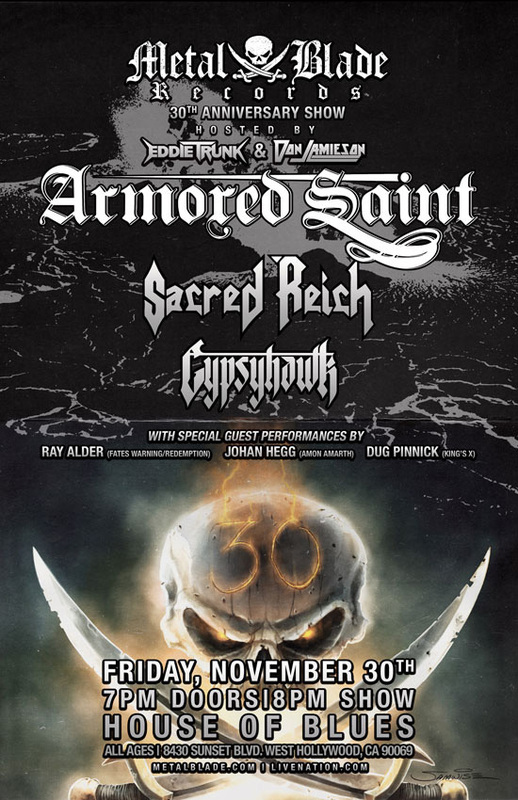 Metal Blade Records is proud to announce that Amon’s Amarth’s Johan Hegg, Ray Alder of Fates Warning/Redemption, as well as dUg Pinnick of King’s X have been confirmed as the special guests for the 30 Anniversary show set for Friday, November 30 at the House of Blues in Los Angeles, CA. The guest musicians will join Armored Saint on stage throughout their set to perform a variety of cover songs. Also confirmed to attend the show and celebration are That Metal Show’s Eddie Trunk and Don Jamieson, who will be hosting the event. Here’s what Don had to say about hosting the show; “So pumped to be hosting Metal Blade’s 30th Anniversary Show with quintessential metal warriors, Armored Saint and a destined-to-be quintessential metal band, Gypsyhawk. Gonna be heavier than Honey Boo Boo’s mama! Metal Blade Records App for iPod and Android now available! The Metal Blade Records app is completely FREE and available for download on the iTunes store HERE and on Google Play HERE.